BMW has announced further details of its Plug-in Hybrid 7 Series models, which bring increased performance and emissions-free capabilities. 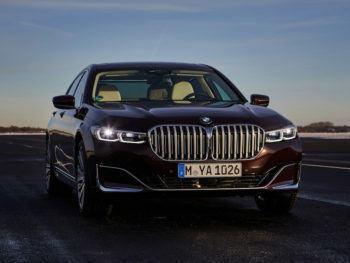 On sale this spring as part of the reworked 7 Series range and priced from £76,815 to £83,560, the plug-in hybrid 745e and the BMW 745Le xDrive replace the previous 740e and use a 286hp six-cylinder in-line petrol engine from the current BMW Efficient Dynamics family of power units instead of the previous 258hp four-cylinder unit. This is now married up with a 113hp electric motor and a more advanced high-voltage battery. The latter is positioned underneath the rear seats, while the 46-litre fuel tank is located above the rear axle. This means that the luggage compartment volume of the plug-in hybrid models is only slightly restricted. The new technology brings a boost in power output and torque, giving a total of up to 394hp power and up to 600Nm of torque in Sport mode. In performance terms, the 745e accelerates from 0 to 62mph in 5.2 seconds while the new 745Le xDrive, which features intelligent four-wheel-drive, cuts that time down to 5.1 seconds. Both models are electronically limited to a top speed of 155mph. The updates to the range also bring improved figures for electric range, fuel consumption and CO2 emissions. The 745e has a maximum electric range of between 34-36 miles (WLTP) depending on driving conditions, while the 745Le xDrive aims to achieve an electrically powered range of 32-34 miles. This compares to 25-29 (NEDC) for the old 340e. Fuel consumption and emissions have also been improved. For the 745e, combined consumption is between 141-123mpg on the NEDC cycle. CO2 emissions are from 48g/km. The corresponding figures for the new 745Le xDrive 118-105mpg and from 52g/km. They also offer different drive modes, which can be selected using a control panel in the centre console and allow drivers to switch between Sport and Adaptive drive functions, as well as Hybrid, Electric and Battery Control drive modes. Sport gives a particularly dynamic set-up, while Adaptive is geared towards matching relevant driving styles and situations. Hybrid is the standard power mode and means that all models can travel at a speed of up to 68mph – 13mph faster than the predecessor models – in purely electric mode while the petrol engine kicks in when he car reaches the higher speed, or the engine is under particularly heavy load. And in Electric mode, the motor can provide a top speed of 87mph. The operating mode is displayed as part of a newly designed instrument panel, easily and clearly identified by means of a different colour. When charging the battery, the driver can see all the relevant information in the instrument panel, such as charge level and duration, charging current, currently available electrical range and the chosen conditioning level. This information can also be clearly seen outside the vehicle. From summer 2019, new digital services will be available to make charging the battery en-route more convenient. When selecting a public charging station, the navigation system also provides the driver with a list of recommended nearby hotels, restaurants, cafés and tourist attractions. The driver is also provided with a charging station occupancy forecast. In addition, BMW Intelligent Personal Assistant is available across the range and serves as an intelligent, digital helper who responds to the prompt ‘Hey BMW’. Other standard specification across the range includes 18-inch alloys and driver assistance systems such as Parking Assistant Plus, which can be used to help parallel and reverse parking and cruise control with braking function.